After completing comprehensive training, passing the examination, and proving more than ten years of experience in the field, SES Project Superintendent, Brian Haase, has been approved as a Certified Inspector of Ground Source Heat Pump (GHSP) Systems. This designation through the International Ground Source Heat Pump Association (IGSHPA) recognizes professionals who demonstrate a high level of competence and ethical fitness in the inspection of ground source heat pump systems. Brian, who is also a Certified Geothermal Installer through IGHSPA, has been active in the geoexchange community for over a decade, performing installation for more than fifty commercial ground heat exchangers, as well as troubleshooting and correcting malfunctioning systems installed by others, and instructing city, township, and county inspectors how to better understand geothermal installations. He is only the second person in the State of Michigan to achieve inspector certification, and is now one of just 49 Certified Geothermal Inspectors in the world. We were pretty disappointed when, in 2016, congress extended tax credits for solar energy systems but left out geothermal HVAC systems. However, earlier this year, a law was signed into effect that extended over thirty tax incentives, including federal tax credits for residential and commercial installations of ground source heat pumps (GHPs). The reinstated GHP tax credits are retroactive to January 1, 2017, and extend to January 1, 2022. While the rules for the credit are essentially the same as before, there is an important change: a new clause allows commercial projects to be in progress at the end of the tax period, rather than having to be in service. These credits provide a 30% tax saving on residential projects, and a 10% saving on commercial projects. However, more important than that 10% is the accelerated depreciation on the geothermal HVAC system. While the 10% certainly helps, it doesn’t get over the first-cost hurdle. That’s where we look to unique financing vehicles, such as PACE (Property Assessed Clean Energy), where the cost is assessed to the property and financed over a term of up to twenty years. We’re so excited that congress has recognized the importance of geothermal HVAC, and is encouraging its growth across the country with these tax incentives. We have helped sustainable projects earn back hundreds of thousands dollars in tax credits and rebates, and look forward to doing even more going forward. If you have a geo project that you need help financing, or simply want more information, click here, and one of our geo experts will get in touch with you! New employees, new p rojects , new PEs….there’s been a lot going on here at SES! If you’re not up to date, check out our most recent newsletter and be sure to subscribe to receive future ones and stay in the loop! Every year, th e Engineering Society of Detroit’s Construction and Design Awards honor projects that embody outstanding team achievement and innovative use of technology. This year, we were proud to be part of DNR Outdoor Adventure Center’s team, which took home an honorable mention at the recent award ceremony. The OAC was such an exciting project to work on and we loved helping to transform a crumbling historic building into an amazing and unique facility that so many people now enjoy! 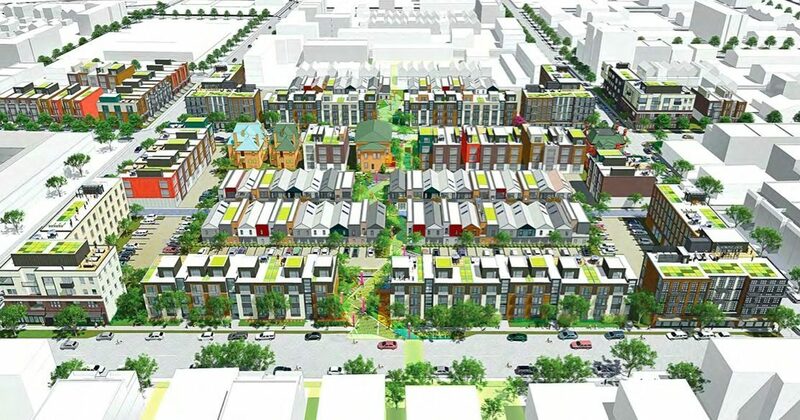 It’s still in the design phase and Brush Park is already winning awards! The $70 million revitalization project was recently named the winner of Congress for New Urbanism’s (CNU) Charter Award Grand Prize. We are thrilled to be part of the team for what is one of the most significant residential projects in Detroit in decades, working alongside several great firms including Bedrock Detroit, Hamilton Anderson Associates, Lorcan O’Herlihy Architects, Studio Dwell, Merge Architects and Christian Hurttienne Architects. It’s been a few years in the making, but Walsh College’s Troy campus is finally able to unveil its renovation and new 55,000 addition. We were there every step of the way throughout this project, from a 2013 study of the original facility to the punchlist efforts just a few weeks ago. The $15 million improvement project achieved LEED Gold Certification with several sustainable features such as daylight harvesting, energy optimization for night occupancy and improved indoor air quality. In order fo r extraordinary minds to generate extraordinary thoughts and ideas, they need an extraordinary environment…and that’s exactly what the Innovation Center is. Rather than a repetitive sea of beige cubicles, the former Woolworth five-and-dime store in downtown Jackson has been transformed into a new LEED facility that accommodates Consumers Energy’s Innovation Group, as well as other tenants. Although the renovated space possesses some open offices, it consists primarily of various common areas for tenants and employees alike to join together in a spirit of collaboration. Click here to read the entire article and learn more about benefits of a VRF system.